This is the beginning of a new series of posts following the previous series called Creating Jesus. In that series, we looked at the foundational stories and three major emergent christological paradigms in the earliest literature. The Jerusalem paradigm was the earliest, viewing Jesus as a human being born of human parents who was possessed by the spirit at his baptism. He died the death of a Jewish martyr and received the reward of the martyr: resurrection from the dead and exaltation as an angelic being, in his case, the Angel of YHWH. Baptism cleansed of previous sins, anointing gave the spirit, and eucharist was an apocalyptic party anticipating the Messianic banquet in heaven and the coming of Jesus as the YHWH angel of Judgment. Pious living in imitation of Jesus the Righteous One is the heart of salvation. This paradigm became very popular in the east, particularly moving through Mesopotamia and eastern Syria, although it appears to be the ground for the other two paradigms and was not unknown in the west. The Antiochean paradigm developed quickly. Although I am not certain if it first fermented in Jerusalem and then was taken to Antioch, or if it originated in Antioch, it became the dominant paradigm in Asia Minor and western Syria. It also traveled west to Rome and became exceedingly popular there. In this paradigm, the possession is moved back to the womb. The Angel YHWH possesses the fetus from the time of conception or the quickening. Mary becomes a virgin who bears a child who already is divine. Jesus is a full human being with an additional aspect to his soul, a special angelic augment. This is an embodiment christology. Baptism and anointing deliver the spirit of Jesus to the believer, so that the person has already been resurrected as Jesus was. Jesus' death functions as a universal atonement. Eucharist is a sacrificial renactment of Jesus' death and is a serious ceremony of mourning rather than a celebratory party. The Alexandrian paradigm is the final one. In it, we move back further to a pretemporal "moment" when the Logos existed as God. The Logos was the mind of God and this is what descends into flesh and becomes Jesus. This is an ensoulment christology where the mind of God functions as the "human" soul of Jesus. Jesus is YHWH walking on earth as a human being. 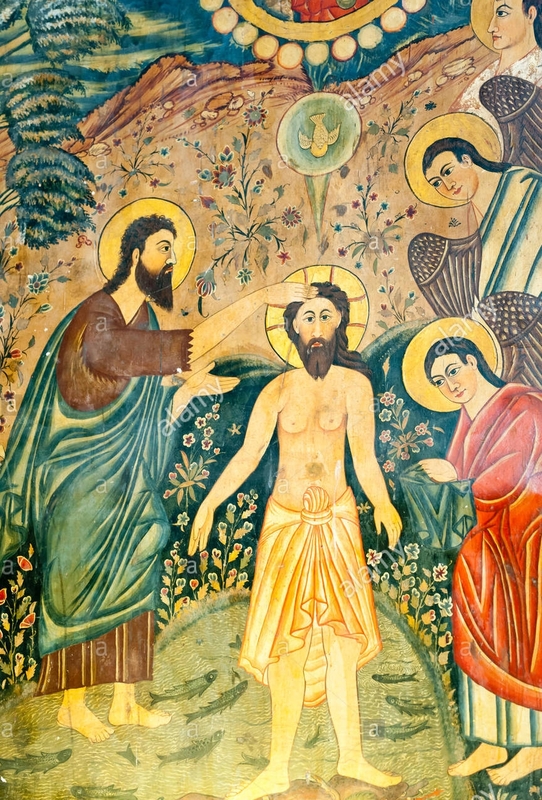 Baptism is rebirth, a transmutative process that recreates the believer in God's image. Eucharist involves consuming a divine body which acts as the medicine of immortality. The person who eats the sacred body finds that his or her own body-soul is slowing transformed into that same sacred body. It is a process of glorification or theosis: becoming god. Now these are the three foundational christological and ritual paradigms which fuel the controversies of the second century and eventually lead to Nicaea. Keep in mind that the second century authors do not necessarily know of these as separate paradigms. Each author will have a tradition that he learned which usually corresponds to his geographical location and the paradigm of the school he attended. But he will also know the paradigms embedded in the things he had available to read and consider "scriptural." Sometimes these authors will mix elements together from the different paradigms, or they will impose upon other paradigms the dominant paradigm they have learned, or they will develop one and not discuss the others at all. It is necessary for us to be flexible and read our sources carefully to determine what is actually going on. The three controversies that become bound up with christology are the Jewish-Christian controversy (How Jewish are we as Christians? ); the Gnostic controversy (Should we as Christians worship YHWH or another god who lives beyond this universe? ); the Monarchian controversy (How monotheistic are we as Christians?). Next time we will begin to look at the Jewish-Christian controversy (although I hope you notice that all three of the controversies I have outlined are REALLY Jewish-Christian controversies). The christology known to Antiochean sources especially is what I call "embodiment" christology. What this means is that Jesus was perceived as a full human being possessed by a spirit or angel from the womb. The important point is that he is a full human being, with his own psyche (=soul) and physical body. The spirit or angel is an extra something that he has from conception or quickening. Jesus functions as a container or vessel for the resident angel. The rest of the Jerusalem paradigm survives intact. He still dies and is exalted to heaven where he is (re)-installed. As this great angel YHWH he will be revealed in the heavens, descending with a cry of command, the archangel's call. He will usher in God's kingdom after he destroys its enemies. He will sit in judgment. This tradition is carried on as late as the testimony of the Ebionites who taught that Christ was created like one of the archangels and was appointed by God to rule over the future age (Epiph., Pan. 30.16.2-4). This is also evidence that some of the Jerusalem sources were aware of this tradition, although it is impossible for me to tell if they picked it up after the paradigm was developed in Antioch, or were responsible for creating it in the first place and passing it on to Antioch. What kind of soteriology is set into place when this christology is developed? Consider again the Jerusalem paradigm where Jesus' transformation into a glorified, divine being happened as the result of his righteous actions and piety, as a reward for upright behavior and obedience. It meant that anyone could imitate him and expect a similar reward - gradual transformation and eventual resurrection and divine body-status-immortality. This soteriology could only work if Jesus was just like you and me. But what happened once he was an embodied angel from birth? A son of God from conception? Jesus didn't have to work for his divinity. He had already in the womb. The road to salvation had no choice but to shift. It had to engage the power of the divine Jesus rather than the human Jesus. Redemption had to happen because of a divine action rather than a human action that could be imitated and repeated. This meant a fuller engagement with martyrological interpretations of Jesus' death which were already existing anyway. This is what Mark is about. So the efficacy of his death for sin atonement of sins of Israel was drawn out and universalized. This doesn't mean that the behavioral soteriology from Jerusalem vanished or was replaced by the divine redemptive action. No. It survives and fuses with the sacrificial so that the sacrificial emerges dominant while the behavioral recedes into the background. It caused trouble though. Consider it. If a divine action redeemed the human being, then what was the benefit of good behavior? Paul has to face this trouble and he tries to explain it in Romans 12-13, where he says that good behavior is the outcome of a person's redemption and transformation, rather than the cause. More on Paul in the next post in this very long series. We now have all the pieces of the earliest christological musings in place, and we can talk about the first paradigm as it was developed by the first Christian Jews in Jerusalem. All that has gone on before in the twelve previous posts should not be taken to be linear development - i.e. first this happened, then that happened. Rather these strands of tradition came together in complexes that brought with them a number of associations and connections that become attached to Jesus simply because they were part of the complex. There is a chicken and egg effect here. The first Christian Jews turn to these Jewish tradition complexes to understand Jesus' death, explain the visions they said they were having of the afterlife Jesus, and to reflect upon and remember his life. Then these complexes haul along associations that then serve to reinterpret who Jesus was, and so the reframing of a Jewish rabbi with messianic leanings as the Mosaic messianic Prophet, the Righteous One, the resurrected martyr, the exalted Angel YHWH-KAVOD who can intercede on our behalf formed in the teachings of the foundational movement. What happens, as far as I can tell, is that the christology which forms gets tied to the soteriological teachings of the group. They go hand in hand. In the case of the Jerusalem paradigm, what you end up with is the christological teaching that Jesus was a complete human being born to human parents. Mary and Joseph are understood to be his biological parents (just as Matthew's and Luke's genealogies relate and the Ebionites later taught). At his baptism, the Holy Spirit descended, and it took up residence in him, possessing him as it did all the prophets of old. As God's Prophet, Jesus called people to repentance, taught people how to interpret correctly and follow the Laws so that they could live righteously and be prepared for the coming of God's judgment. Ultimately he was rejected. He suffered a terrible death as was foretold in the scripture, a death that atoned for the past sins of Israel. The Holy Spirit left him at his death. But because he was a righteous man and faithful to God, God rewarded him with resurrection from the dead, transforming him into an angelic body and exalting him to God's right hand as the principal YHWH Angel, vested with the powerful Name and enthroned. In this capacity, he will return to judge the living and the dead. As a result of this teaching, the doctrine of the second coming was born, as well as the divinization of Jesus. Jesus was not divine during his lifetime, any more than any other prophet. He was a human being possessed by the Holy Spirit, exalted to divinity after his death. In the next post, I will take up how this christology affected the group's soteriology and ritual practice. Then on to Antioch!